Sleepy Hollow's Fall Finale Changes Everything...But Should It? Well, THAT was an episode of television! For its fall finale, Sleepy Hollow pulled out all the stops and went straight for Moloch. But what about all that collateral damage? Let's be honest: Sleepy Hollow, at its best, is one of the most fun shows on TV. But season two, so far, has largely not been the show at its best. The longer episode order meant that major arcs lost momentum, and unnecessary cast changes sidelined some great characters and introduced new ones with little payoff, so pulling out a huge cliffhanger ending doesn't feel earned. And for a show that tries so hard to engage fans—including tie-in novels, comics, and a Secret Diary of Ichabod Crane—this episode seems to have transcended mere second-season growing pains and reached a level of "Wait, what?" that would be almost impressive, if it wasn't so baffling. The episode's titled "The Akeda," a reference to Abraham's sacrifice of his son Isaac, which the show used as a parallel to Ichabod's dilemma with Henry. And while that makes sense given the episode's endgame, it took a while to get there, and that final faceoff feels more like a bizarre surprise party than the narrative game-changer it could be. But it worked! There are a lot of questions left to answer when the dust clears, and several moments from the episode suggest that Sleepy Hollow is about to change. A lot. Any mythology goes. We should have known Sleepy Hollow wasn't going to settle for just one mythology forever. This whole caper might have started as just two kids with nothing going for them but Washington's Bible and a dream of stopping the Christian apocalypse, but a show that delights in checking off so many genres every season was eventually going to move beyond Purgatory and the ol' ring of heavenly fire. However, playing fast and loose with mythology means that sometimes the stakes aren't clear and moments that should be big payoff just feel confusing. Moloch's rise came so suddenly,and the sword was such a last-minute Macguffin, that it's hard to say what the victory actually meant. When Henry stabbed Moloch, did that banish him back to Purgatory to start over? Did it kill Moloch forever and seven years of tribulation have suddenly vanished? Is it Gorgons from here on out? A bold move? Absolutely; imagine bringing Mulder's sister safely home at the end of season one and then he decides to just investigate fraud cases and Scully joins Internal Affairs (you know she would). 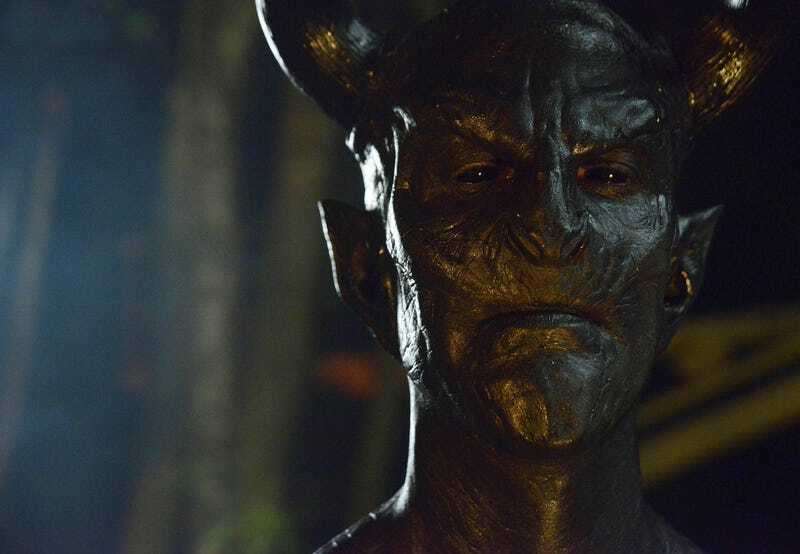 But it also seems awfully risky—Moloch's scariness had taken a distinct downturn in the second season, when he went from a stuttering shadow that had anointed two sisters into a world of terrible demons to a Legend monster who spent all season chastising a mopey Henry. He probably regrets doing that now, given how Henry turns on him. Never trust the quiet ones. Given that he's been slowly deflating all season, it makes sense he'd have to go to make room for a new villain, but why is that where he ended up in the first place? Why was he drained of his menace? Was that always the plan—some commentary on how our demons are always more commonplace than we think—or did Henry just ruin this like he's ruined everything else? The show made a huge mistake killing Irving. Aside from the fact that Orlando Jones has been a one-man promo engine for the show, reaching out directly to fans and engaging with subjects as varied as Ferguson and fanfiction, Irving was one of the best things about the first season. His skepticism lasted exactly as long as it should have before it gave way to badass reality check: he's still one of the few TV cops ever to call backup before marching into the warehouse full of dangerous armed guys, and even in this episode, he used Revolutionary War codes to alert his team to his prearranged remote underground location, which is some pretty great planning, all told. It's one anagram short of genius. He looked good doing it, though. It's still possible we'll see Irving again. The reason he could wield the sword in the first place is because Henry had already claimed his soul, so the show could still surprise us and have Henry bring him back as an apology for nearly summoning all the powers of hell just because his demonic stepdad asked him to. He could join the ranks of Andy, who was dead all last season and managed to pop up an awful lot. But if not, they've cut one of the core cast members, after spending the first half of the season essentially switching him out for the blond white guy who came out of nowhere and has been blanding everything he touches. And while I get that things were busy, it's sad that the show's built up so much bad faith that I expect that, if he's really dead, that's all the mourning he's ever going to get. Katrina is beyond saving. As we have all been discussing for way too long, she was ill-used last season from moment one. In the relentless race to the finish last year, it was easy to chalk this up to awkward story requirements: Katrina needed to be in Purgatory to remind us about the threat of Moloch. And even though her breathy exposition never actually helped and her backstory felt like a pinball game, it was an arc that could be repaired in the second season...until she got handed over to Headless like a damsel. Her arc at the beginning of the second season began like one of those tropes the show loves, and glimpses of a shirtless Headless Horseman showing off for his captive and moodily cooking her breakfast felt like the beginning of Katrina using those spy skills we'd heard so much about, or those magic skills we'd heard so much about. Except then she did, and...it didn't work. So she escaped, and...it didn't work. So she went back, and escaped again, and went back again, and escaped again, and by the time she finally broke out and tried to join the main crew, it wasn't just Abbie rolling her eyes. Recently, Katrina has been impressing us by doing things like passing out while trying to perform magic, leaving Abbie to do it effortlessly, or demanding that people stop making mean plans about her son, who never did anything to anyone except be evil and curse people and arrange deaths and raise the Devil by impregnating her. There have been some great Katrina moments this season. Most of them involved people demanding to know why she's always withholding information, which is great, and her admission that she knocked a woman off a cliff "by accident" to keep Ichabod in the States was maybe her single greatest moment. But the show has proved her to be ineffective again and again, and this episode was no exception, as she enchants her amulet so everyone near her can see Headless (why has this not come up before?! ), enchants a sword to look like another sword...and that's it. She couldn't counter Henry's vine restraints; she couldn't even make enough noise to announce that Headless was trying to raise the Devil in the backyard of the house. Ichabod and Abbie are inside during this, mere feet away, marveling at how empty everything this and quietly stringing red thread around the evil diorama to reveal a pentagram that actually means nothing to what they're actually doing; the show just wanted to make sure we used that diorama one last time. It's a handy metaphor for how the show has always treated her; doing something ineffective around a bunch of people who don't really care, and then botching every chance to prove herself. Even her stubborn faith in Henry doesn't pan out for her—at the last second it becomes about Henry and Ichabod, because Abraham and Isaac, so somehow Katrina can't even get the payoff from her one through-line of agency. But what Katrina did through most of this episode was side with Abraham, Headless Horseman, Esq. I will admit: in some ways, this is so nicely soapy I'm into it. She's escaped so many times that the initial gross threat of her captivity has fizzled, and the show seems to be increasingly hinting that she might just belong with Abraham because they're both a little terrible, which I find hilarious and would be happy to see pan out. They deserve each other. The upside is that Katrina and Ichabod, who it turns out has sort of had it with Katrina after the cliff-pushing and the Abraham-defending, essentially break up (yay!) until after Moloch is defeated (wait, which kind of death, hold up). "If Henry stood in the path of defeating Moloch, would you be able to kill him?" Ichabod, she's not able to do ANYTHING. Can this marriage survive? I mean, it might, they've dragged it through the mud this long, but Katrina has been such a definitive flop of a character that I can't imagine how they'd salvage it. And honestly, given that a much better character bites it this episode, it seems doubly hard to justify Katrina sticking around. Ichabod and Abbie's relationship will change. This is actually not a bad thing. I mean, everyone loves Ichabod donning a little Romantic Lead Face to remind Abbie about their sacred Biblical duty to stand really close to each other a lot, exchange expressive looks, and fight evil (time permitting). That Cirque du Soleil troupe nearly made it! Either way, I suspect these two will be fine. Executive producer Mark Goffman has confirmed that whatever comes between them now, it won't be Hawley, given that Abbie could never seem to understand why she had to hold a conversation with Hawley ever. And when Ichabod and Abbie reunited to tackle Gorgons and Arthurian swords, they'd lost none of their charm—or their power, since Abbie's determination to wield the sword against Ichabod's protests provided one of the most intense moments of the episode (Nicole Beharie's delivery of "first" is a perfect encapsulation of the frustration a lot of us have felt about her situation lately). So long as the show remembers these two are better together, we'll be in for a lot more eyebrow-raising banter, close-talking friendship, and battles against the forces of evil (time permitting). So what now? Well, at this point, pretty much anything goes, doesn't it? A lot will depend on the definition of "dead": for Moloch, for Irving, and for Katrina and Ichabod's marriage. But with a cliffhanger like this one, the whole point is to walk away with questions. Is Abraham supposed to stand up again and take on the mantle of Terrifying Evil rather than Disgruntled Boyfriend Who Makes a Lot of Angry Mirror-Phone Calls? Has Henry become a different kind of villain, or was that his one-stroke redemption arc and now he's going to settle down and sell hand-whittled carvings to tourists? Will Hawley stick around, presumably relegated to mansplaining stuff to Jenny now? Remember Jenny? The thing is, throughout most of the other frustrating moments the show has given us, there's always been enough to keep me watching. In the first season, it was the sense that the show knew exactly what it was doing, tonally, and that the balance could be maintained. A midseason finale like this one is asking for a lot of trust that the show has plans that will all pan out. I'm hopeful; we got Ichabod and Abbie working together again, Jenny came back from the Canadian border, and the debate about Henry that feels like it's been going on in real time for two hundred years is finally, maybe, at an end. But we won't know until the show comes back from winter break! The good news: it's a short break. See you in January, show.